Graphite Magazine is one of the newest periodicals from 3DTotal Publishing. There’s a new issue every quarter with 4 total magazines per year. But Graphite isn’t just your traditional magazine. This almost feels like a premium art book designed specifically for professionals, aspiring artists, or anyone who just loves art. You can learn more about this on the main website but I’d like to share my thoughts after skimming Graphite issue #06. Let me just say this comes with a beautiful print job and it feels more like a book than a magazine. The paper quality is thick and smooth, the artwork is printed in super high resolution and the magazine itself just feels like a keepsake of the art world. Graphite Magazine is literally the opposite of the thin mags you read to kill time on the train or in the doctor’s office. This is something you’d feel proud to keep on your shelf or display openly on your coffee table. But let’s dive into the magazine to see what it offers. Each issue covers a variety of topics but don’t think of Graphite as just a pencil-only magazine. Really it’s more of a traditional-only magazine focusing primarily on traditional art. This includes watercolors, oil paints, colored pencils, and yes plenty of graphite sketching. There’s also a whole section featuring a gallery of artwork that you can skim for inspiration, ideas, or just to find new artists to follow online. You’ll notice there’s a lot of variety in here too. Some chapters focus on illustration work using watercolor paints. Other chapters get into creature design or using rough thumbnails to create a sci-fi character from start to finish. 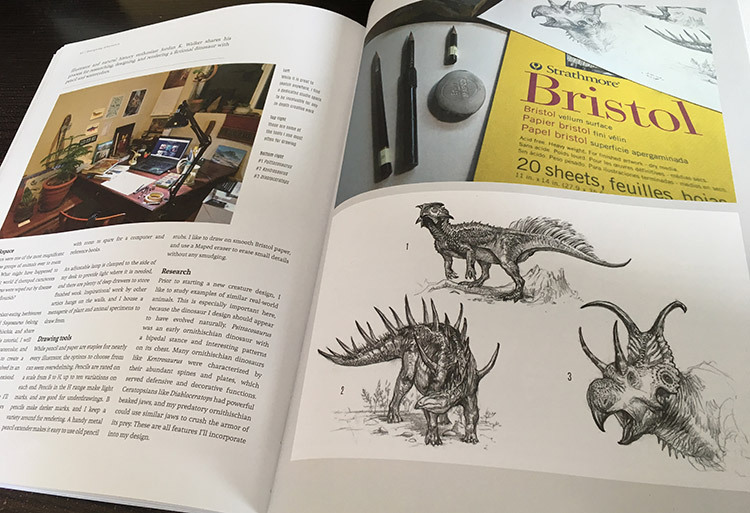 The book is one part inspiration, one part “how-to” and a dash of a featurette showing off artists and their workflows. 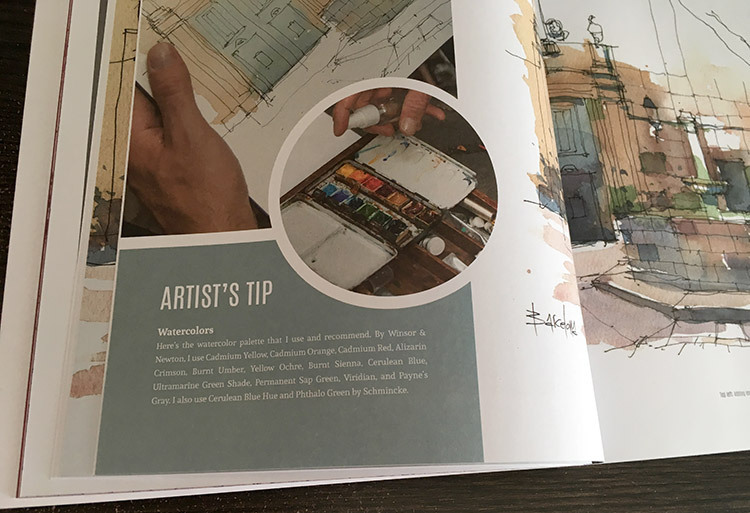 For example the chapter with Daniel Pagans talks about watercolor work on location in Barcelona, Spain. This is a really fun chapter that you probably can’t follow without living in that area. But the various techniques you’ll learn and how you approach any subject outdoors can be replicated if you go out and do some watercolor work. Same can be said for artist Dwayne Bell who shares his process for observational sketching. Every artist should know by now that drawing from life is huge. It’s basically a must-do activity. Granted this book isn’t meant to teach you everything about life drawing or drawing on location. It’s just a way to peek into the minds of other artists and see how they do stuff. 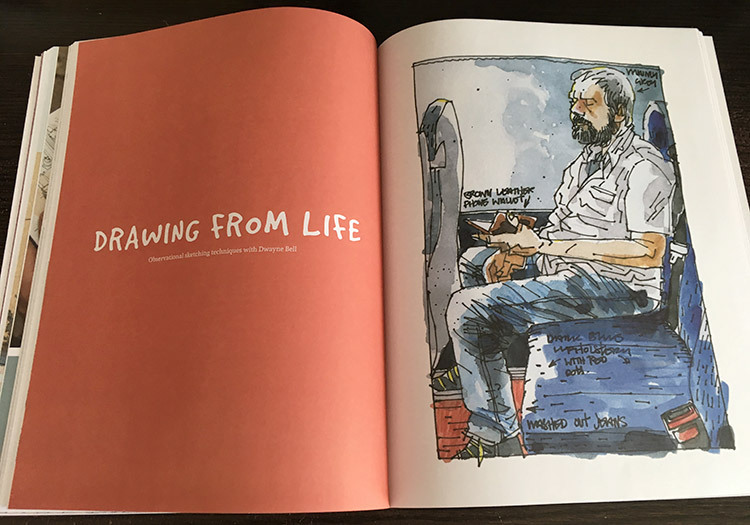 It offers a fun look behind the curtain into the lives of other professional artists. You get to see their process, their design patterns, and how they approach new ideas or practice sessions. The issue I’m reviewing(#6) is one of many so there’s a lot of great material out there. I really like the artist interviews and find them pretty eye-opening. Not to mention every page is full of brilliant artwork, photos of the artists themselves, or photos of their art supplies. Earlier I mentioned the high-quality print job and I really should mention this again. Graphite Magazine feels like an actual book that you’d buy in your local bookstore. The pages aren’t glossy but they don’t feel cheap either. Just thick enough to feel sturdy but not so thick that you’re turning cardboard. I can’t praise the print quality enough. Same goes for both the actual written content and the design style of the magazine. The content is genuinely fun to read and there are so many photos not just of artwork, but showing off art studios and work stations for each artist. You get a glimpse into each artist’s setup, their preferred materials, and their creative process. Typically that’s hard to find in print and it’s even harder to find with traditional mediums. 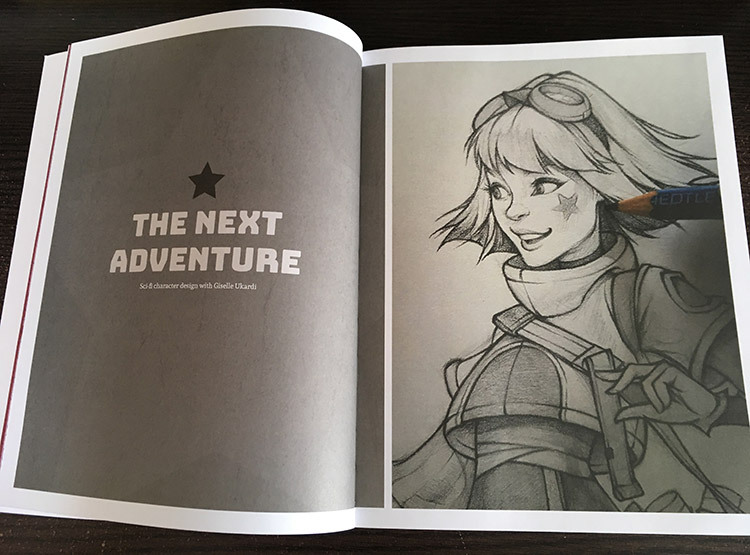 Really what you get in Graphite is a bunch of resources/interviews/inspiration related to traditional art, all packed into a 100-page tome with some of the highest quality paper I’ve ever felt. Who Would Love Graphite Magazine? If you frequently work in any traditional art mediums then Graphite is perfect for you. 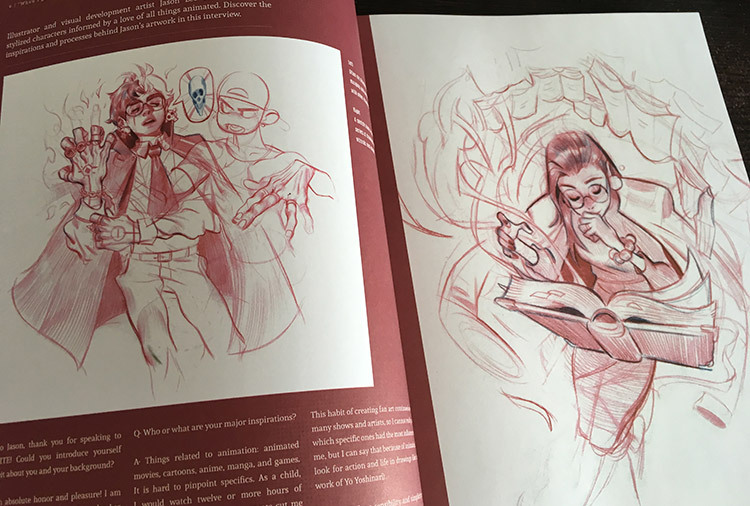 I recently reviewed a copy of Character Design Quarterly and that magazine leans more towards digital art & entertainment art. If you’re solely interested in digital artwork then you’ll really prefer the CDQ magazine(also releases 4 issues a year). Now if you’re just someone who loves all forms of art then you’ll probably want copies of both. Graphite is a bit lighter on the “how to” content because it’s not meant to be a teaching tool. You might find more step-by-step content in CDQ but in Graphite you’ll find more creative ideas that you can apply to your workflow. Don’t subscribe to Graphite expecting to learn how to draw or to become a pro artist. That’s not the goal and if you are a beginner maybe look into some basic drawing books to get started. Think of Graphite Magazine like a mini documentary or a behind-the-scenes look into the art world. With every issue you’ll find new artists you never knew about, their unique workflows, some tips & tricks, and plenty of inspiration that’ll leave you reaching for your drawing pad. I definitely like the magazine and really do recommend it for traditional artists. If you’re brand new to drawing this probably won’t be as useful technically, but it will inspire you to keep practicing and pushing your art skills further. Check out the Graphite Magazine website to learn more and visit their FAQ page for answers to some common questions about this incredible quarterly art resource.